"Sampath Speaking" - the thoughts of an Insurer from Thiruvallikkeni: the kahani of Abhinav Mukund ~ debut need not be the indicator !! 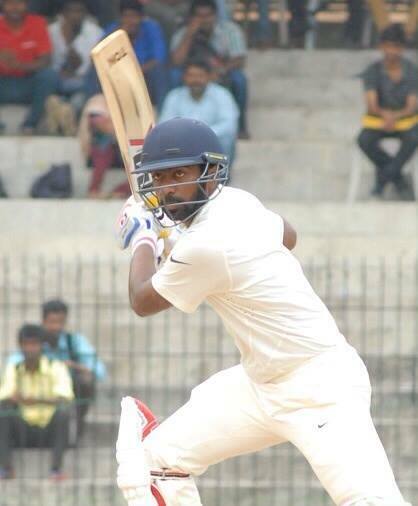 the kahani of Abhinav Mukund ~ debut need not be the indicator !! In the 1st Test at Galle, Hardik Pandya and MD Gunathilaka made their debuts and both would have different views of remembering this Test match. The news is, India today comfortably defeated Sri Lanka by 304 runs bundling Lankans out for only 245 runs in their chase of 550 in the second innings on the fourth day at Galle. For India, spinner duo of Ravichandran Ashwin and Ravindra Jadeja scalped three wickets each to help India take a 1-0 lead in the three-match series. After opener Shikhar Dhawan and middle-order batsman Cheteshwar Pujara slammed their centuries in the first innings, skipper Kohli joined the bandwagon in the second to score an unbeaten 103 off 136 balls. Aided by this knock, Kohli's 17th test century and Abhinav Mukund’s 81 – India left a target of 550. On Day 4, after they lost two quick wickets just after lunch, Lankan opener Dimuth Karunaratne and stumper Niroshan Dickwella steadied the innings to take the score to 192/4 at tea. However, Karunaratne's 97 and later Dickwella's 67 did not prove enough to see the hosts through in the match. Abhinav Mukund is not the 1st choice ~ not the 2nd even; he got to play as Murali Vijay and then K Rahul were not fit to play. Mukund is a fluent batsman through the off side with a penchant for big scores. Before his 20th birthday, this left-hand Tamil Nadu opener had to his name a triple-century, hundreds on Ranji and Irani Trophy debuts, and a quadruple-century opening stand for his state side with fellow India Test opener, M Vijay. Last year too, he scored runs in buckets, but that is nothing new – getting selected for the National team however, is. In 2012-13 he was, in his own words, at an all-time low. He wanted to give up the game. He didn't even want to watch cricket. Abhinav does not call it depression, but rather a case of wanting something too badly. It reflected in his performance - his average dipped from nearly 73 in the previous Ranji Trophy season to under 30. Statistics reveal that Mukund has played 7 tests scoring 320 runs ~ in 1st class he has scored 8657 runs with 26 centuries at a average of 48.09. He played his first test at Kingston in June 2011 (test no.1997) scoring 11 & 25; then 1 & 48; 62 & 0; then in England 49 & 12; 0 & 3 – then waited for 6 years to play Aussies at Bengaluru scoring 0 & 16. S0 when he was out for 12 in the 1st innings, most of us thought, that his test career is over – providence gave him another opportunity, he has scored 81, yet unsure of playing the 2nd test if KL Rahul is fit to play. Alongside Mukund, Praveen Kumar and another batsman debuted. That batter scored – 4; 0; 30 in 3 Tests – do you know where he is know ? 4603 test runs and over 8000 runs in ODI – yes it is the present Captain Virat Kohli. On June 20th, 2011 in Jamaica both Virat Kohli and Abhinav Mukund made their Test debuts for Team India. Both were nearly the same age and had come in earmarked to take Indian cricket forward in the years to come. The duo had played alongside each other in junior level cricket a number of times and looked set to take that into the next phase. But the careers careened off in totally different paths. Mukund started better than Kohli but couldn't cement his spot in the side as a reserve opener. Kohli, meanwhile, went on to become one of India's middle order stalwarts and then their captain. In the 62 Tests that India played after the Jamaica Test, Mukund only got to play in five. At the same time, Virat Kohli played 55 Tests. On a batting paradise, Mukund scored 12, the other opener Shikhar Dhawan 190; India amassed 600, and unless they batted again, Mukund's chances of playing again looked bleak. He gave his all on the field, throwing himself around and taking a stunning catch after helping effect a sharp run out. He still needed his second innings to make amends. When India decided to not enforce the follow-on despite taking a 309-run lead, Mukund made it count. Against an already battered Sri Lankan team, Mukund hit a career-best 81 before being out off the last ball of the day. A hundred for the taking missed, but still 81 runs that showed he wasn't the wrong choice for India. Mukund might still not make it to the final XI for the next game, but will be a happy man and India Team has got such a strong bench strength that has Mukund, Dhawan, Rohit, Karun Nair, Jayant Yadav, Kuldeep, Bhuvi, Ishant ~ that they can even dream of replacing their playing X1. Years ago, when Sachin Tendulkar debuted, that was also the first match for : Waqar Younis, Shahid Saeed and SA Ankola. For Shahid Saeed and Salil Ankola that was to be their only Test.